I gave her a couple of pointers on how to cook it. While she was talking to my sister, I wasn’t paying attention to her cooking or to anything at all for that matter. I mean, I just woke up. It didn’t even phase me when she cracked open the eggs and put them in the skillet. It was then that I finally realize what just occurred. While the rice was in the pan, she put in the eggs. I felt (and I still feel) quite bad about the whole incident. Because of my mistake for oversight, I will reveal how to cook fried rice correctly. Vegetables (Optional) - Some people like to just use frozen cut up vegetables with the basic corn, cubed carrots, and peas. But really, with fried rice, you can put anything. There could be mushrooms, cabbage, celery, etc. Don’t be afraid to experiment with this. Just note that if you use frozen mixed vegetables, please exclude the lima beans and green beans. Beans and legumes just do not belong in fried rice. Meat (Optional) - Often, people use ground beef or spam (the meat, not the junk mail). Again this is something to experiment with. 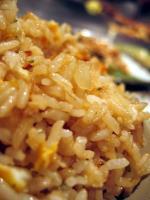 Like many recipes, fried rice is not exact. There are many different variations and this is just a base recipe. I suggest that you cook a batch with just one egg to see if it turns out all right. Pour the entire beaten egg mixture into the pan. Scramble the eggs immediately. Continue to scramble and keep the egg from conglomerating into big pieces. You want it to be as loose and as small as uncooked rice. Keep on cooking them until they brown. It is okay to mix the eggs, onions, and garlic together. If using vegetables, add them to the mixture in the pan. Cooking times will vary depending on which vegetables and forms are used. For example, frozen corn will be faster then raw corn. Again, brown the vegetables. Add the rice and “scramble” it until is separated and without clumps. Some like it to glisten with oil. Add two tablespoons of oil if desired for this effect. Basically, every time you add another ingredient, you want it loose, dry, grainy, browned, and crisp. In the end, it should not be mushy or clumping. I hope this will be a helpful guide when cooking fried rice. Just please remember that eggs go before the rice! Feel free to ask any questions or leave any comments via the comment form at the bottom of this page! This entry was posted on Thursday, January 19th, 2006 at 9:53 pm	and is filed under Cooking, Food and Drinks, Recipes. You can follow any responses to this entry through the RSS 2.0 feed. You can leave a response, or trackback from your own site.